It does not cost you more to work with a bureau that co-brokers an exclusive speaker from another bureau. A common misconception here is that all speaker bureaus split commissions in a co-broker situation so that the price will be the same regardless of speaker exclusivity. While this is indeed true in many cases, it is not always the case. Some co-brokering bureaus do not split commissions and require that the “buying” bureau add their commission to the standard speaking rate. This practice is frowned upon by the IASB but it does take place on a regular basis. The level of service provided is improved in a co-broker scenario. Remember the “Telephone” communication exercise? A group of people sit in a circle, one person thinks of a sentence and then whispers that sentence to the person sitting next to them, etc. The funny part is that something like “The Red Fish Sails at Dawn” comes back at the end as “ The Dead Fish Snails at Prawn.” This perfectly illustrates the communication outcome you often have in co-broker situations. No matter how good, professional and well-intended the participants, communication does not improve with additional variables. Chart One shows you the standard flow of communication when working directly with a bureau. Chart Two is an example of a co-broker communication chart. 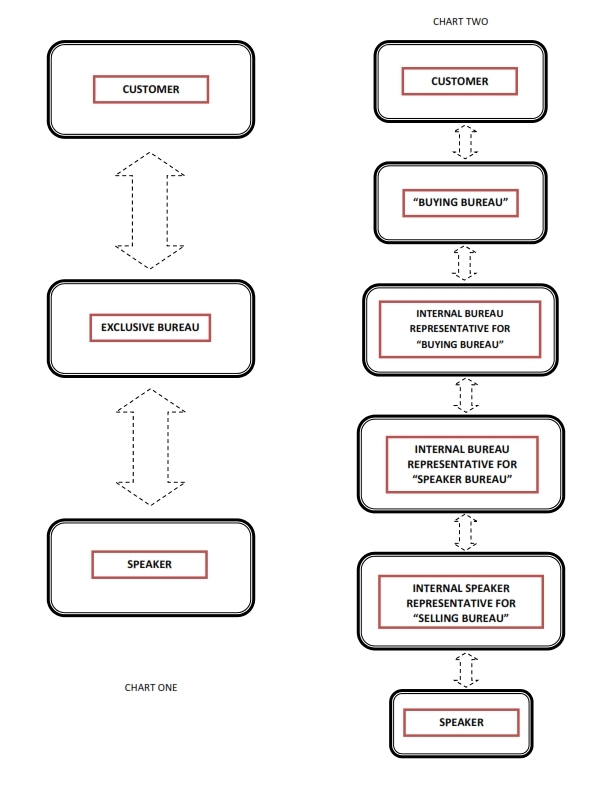 We do not want to get too deep into the co-broker weeds, but most speaker bureaus have a specific position to handle the bureau relations (the internal speaker representative, as shown in the chart), further complicating the communication chain. Tough to imagine a situation where Chart Two improves the service process. This process bogs down even more when a West Coast bureau is co-brokering a speaker with an East Coast bureau for an East Coast based client. A time change working against the process is never a help. Any speaker bureau can secure any speaker. A speaker bureau that represents a speaker on an exclusive basis does not have to co-broker all of their speakers. As a general rule, larger bureaus like Harry Walker and Washington Speakers Bureau will not co-broker their top tier speakers for two reasons. First, the demand for speakers like President Clinton, President Bush, Secretary Clinton, Condoleezza Rice and others is higher than the supply. Why split commission with the competition when they can make a full commission? Second, and probably most important, is the communication issue outlined above. There are a lot of moving parts when scheduling speakers of this stature. The expectations from both the speaker and client sides are equally high. Communication and execution needs to be perfect; there is no room for error. If you are scheduling multiple speakers for an event and do not want to be working with multiple agencies. If you are working with an agent that you have worked with for years, who understands you, your process and your desired outcome. Are you splitting commission or “adding on”? There may be times when value is there to pay a higher fee….the agent maybe attending the event, giving you books, etc. Have you ever worked with this bureau before? Speaker bureau contracts, processes, and cultures differ. Your bureau should have experience working with the other bureau. Have you ever worked with this speaker before? Co-brokering speakers is not rocket science but there are many layers and nuances to the practice that can make a transaction of this nature challenging. The Speaker Experts are always available to answer questions ranging from finding the direct source of a speaker, to how the co-brokering process works.